Never mind Mandarin, coding is the language of the future. 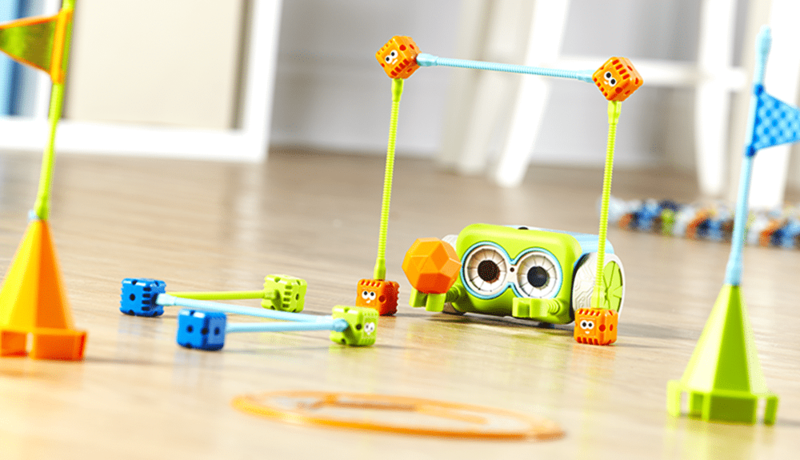 Say hello to this cute coding bot from Learning Resources! Stop rolling your eyes, tech-weary parents! You’ll like botley, a cute coding bot from Learning Resources, which teaches 5-9 year old kids to code through play and without using screens (YAY!). Its based around visual ‘direction’ cards and a remote transmitter, allowing kids to code Botley for up to 120 steps to follow lines, make sounds, loop around, stop in front of objects, move them or even deliberately avoid them. As you’d expect, Learning Resources promise to develop your child’s critical thinking, problem solving, and social and physical development. Even if your kids show absolutely no sign of wanting to be the next Steve Jobs, they’ll enjoy playing around with the bright 77 piece activity set with 40 coding cards, remote programmer, customisation stickers, detachable robot arms and accessories (sticks, cubes, cones, flags, balls and a goal) and leave you alone for hours on end to get back with to the hard work of studying Grazia.